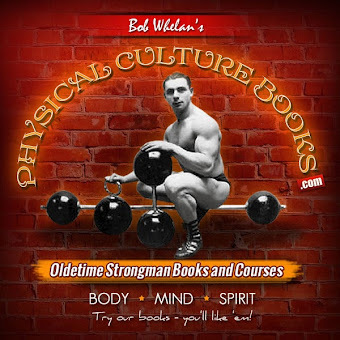 Having dealt with the subject of big bones versus small bones, this seems a good time to discuss other physical characteristics which are in themselves natural advantages to the strong man. Broad shoulders, for example, are a distinct advantage, simply because they are but another indication of a large and strong bony framework, which would be a good foundation on which to build muscle. There is, or should be, a relation between the size of your chest and the breadth of your shoulders. If you have a very small chest, it would be unnatural for you to have very broad shoulders, and vice versa. When speaking of a man who is very strong, it is customary to say "he is a broad-shouldered, big-chested fellow." 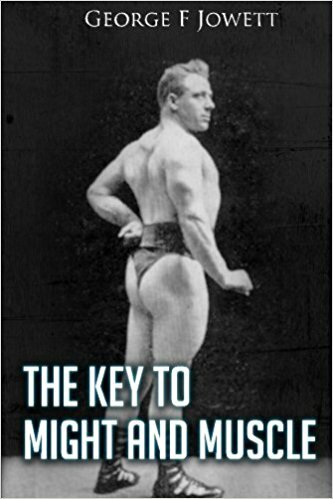 If you have broad shoulders you have at least three distinct advantages: (1) the vigor which you derive from the extra-size lungs in your big chest; (2) the extra room for muscle on and about the shoulders themselves; (3) the greater muscular leverage which comes from the wide spread of the shoulders. Therefore any man with broad shoulders I potentially strong; that is, he has the possibilities of strength, which he may realize if he develops all the muscles of the shoulders. 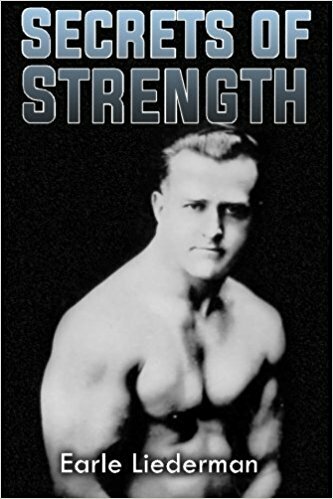 In another book, "Muscle Building," I have given instructions for obtaining that development; and so here I will merely explain that the width of the shoulders is governed not only by the size of your frame, but by the size and development of the deltoid muscles on the points of your shoulders. In a true "Strong Man" -- be he professional lifter or otherwise -- these deltoid muscles are of extraordinary size. Whereas in the non-athletic type the deltoids are only a fraction of an inch in thickness, and so little developed that it is impossible to trace their outlines. In a "Strong Man" they may be anywhere from an inch to two inches thick. Just figure for yourself how properly developed deltoids will affect the appearance of your shoulders. The deltoid gets its rounded form because it covers the head of the upper-arm bone. If your deltoids re thin and weak, then the points of your shoulders will be bony, that is, you will be the kind of man of whom people say "Oh, he has shoulders like a hat rack"; but if you develop the deltoids so as to make them as strong as they can be, you will at the same time make them each an inch thicker, and that will add a clean two inches to your shoulder breadth. Without powerful deltoids no man can be really strong, for they are in important link in the chain of muscles which move the arm. A man can have a bib rib-box without very much deltoid development. He can have big upper arms, with but moderate deltoids; but if a man has highly developed deltoids, he is almost sure to have a broad back and big arms. For it is impossible to make your deltoids big and strong without making the arms and back bigger at the same time. The deltoids "connect up" the strength of the arm and the strength of the body. Casual observers do not comprehend the importance of the deltoids. On seeing a lifter or a weight thrower, or a great gymnast they will exclaim at the size of his arms and the width of his shoulders, not realizing that it is the big deltoids which make the arms look so thick and which make the shoulders so unusually wide. Since the deltoids lift the arms from the side, there must be other muscles which pull the arms downwards; and these muscles are located on the back and the breast. Now, if the deltoids are big the muscles on the upper back are bound to be as big in proportion. 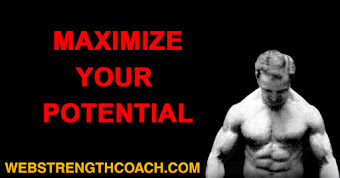 When you see an athlete who has deltoids so big that each one looks almost as big as a baby's head, get behind him and take a look at his back; you will then find that across his back from shoulder point to shoulder point there are hills of muscle with valleys between; and if you let your gaze stray downwards you will note that from arm-pit to arm-pit the back is very broad and that the size of the body tapers inwards at sharp angles to the waist. That is something that you see, not occasionally but invariably, in the true "Strong Man." Knowing all this will perhaps make you realize the importance of broad shoulders. Sometimes you will be sitting in a train and some big chap will saunter in and sit down two or three seats ahead of you. And you will think it lucky that he got a seat to himself for his shoulders are so broad that they take up three-quarters of the room allotted to two people. You wonder if he is a football star, a piano mover, or perhaps a heavy-weight fighter. Whatever he is, you instinctively credit him with being tremendously strong. If you will recall what I have just told you, perhaps you will be able to figure out the different things which help make these mighty shoulders so impressive. If the shoulders are wide, take a look at his sleeves, and you will note that they are so cut as to make room for upper arms which are as big as some men's thighs. If he leans forward take a glance at his back, and see if it is not true that just below the arm-pits there are two bulging masses of muscle. Without doubt you have more than once seen such a man, and all you grasped was that he was broad-shouldered. The next time check up, and you will see for yourself that he has all the characteristics I have just listed, and that if one is missing he will somehow fail to give you the impression of being very strong. The average man's shoulders are only 16 to 19 inches broad, whereas with some "Strong Men," athletes and heavy laborers you can take a 24-inch rule, lay it across their upper backs, and a man standing in front would not be able to see either end of the rule. While everyone knows the strength-value of broad shoulders, there are but few who ever consider the importance of broad hips to the strong man. In fact it is just the other way around. When a novelist wishes to endow his hero with all the desirable physical gifts, to make him speedy and shapely as well as strong, he will write: "He was tall, broad-shouldered and deep-chested, but with the trim hips that added grace and elegance to his figure." Others describing such a man will say that he was "thin flanked." Such is the structure of the hips that they are heavily muscled at only one place, and that is the buttocks. A man may have highly developed gluteus muscles, which is to say that the buttocks may project considerably, and yet his hips may be narrow. The hip-bones themselves -- the pelvis -- form a basin which acts as a sort of floor to the abdominal cavity. The bones of the thighs fit in sockets at the outer side of the hip bones. Which means that if the pelvis is wide the thigh bones are spaced wide apart, and if the pelvis is narrow the thigh bones are closer together. All of which affects a man's strength because it has a very direct influence on the firmness with which he stands. If the hips are broad, the legs are wider spaced and their owner will naturally stand with feet further apart than will a narrow-hipped individual. Also the wider-spaced bones will give more room for muscle. Just as it's easier to upset a small, high table than to upset a low, broad table, just so is it easier to upset a narrow-hipped man than a broad-hipped one. In a man the thigh-bones are not perpendicular but incline slightly outward from knees to hips. In a woman the thigh-bones incline outwards at a much greater angle. A woman's hips are broader in proportion to her height than are a man's, which explains why the upper part of a woman's thigh is bulkier than a an's thigh. And it also explains why some women are so strong in certain ways. A woman's strength lies almost entirely in her hips and thighs. As compared to a man's her arms and shoulders are weak, but in feats which require hip and thigh strength she can sometimes equal the efforts of a man of equal weight. I have seen girl fancy-dancers who could easily back a man across the room in a pushing contest. According to those tables of ideal proportions, the hips of a man should measure only two or three inches less than the normal chest measurement at the level of the arm-pits; the difference being greater in a tall man, and less in a short man. Judging by what I have seen, this rule has no universal application. Arthur Saxon's hips were big and square and he probably came near the required proportions. 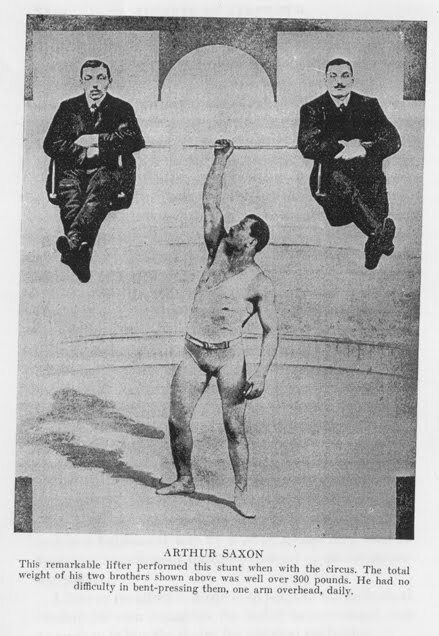 George Hackenschmidt had even bigger hips than had Saxon, but the difference in the size of their chests was even greater. 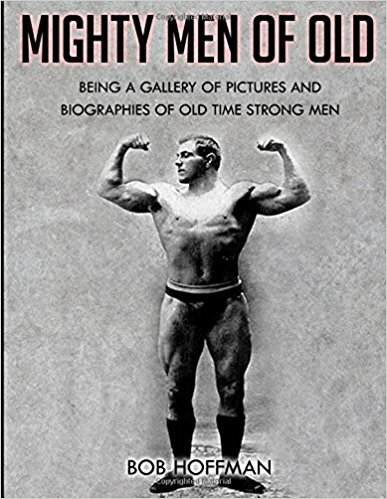 I have not the figures before me, but I would guess that Hackenschmidt, whose bones were unusually large, had 42-inch hips and a 52-inch chest, which is 10-inch difference. Sandow, with whose physique no one but himself could find fault, showed a 5-inch difference; for his normal chest was about 44 inches around and his hips 39 inches. 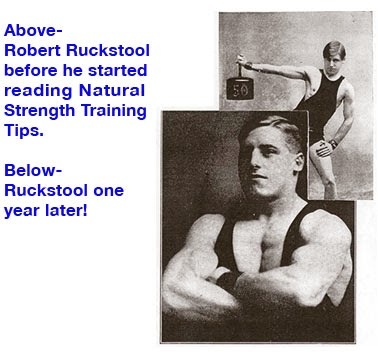 Even in the case of Oscar Matthes, who is about the shortest "Strong Man" on record, the difference was 5 inches, i.e., chest 40 inches, hips 35 inches. You may recall that Matthes' thigh measured 21 inches and that it seemed hardly big enough to fit in with his other measurements. The explanation is that with hips measuring only 35 inches it is hard to build up a thigh larger than 21 inches around. There simply is not room for more muscle. Owing to the outward inclination of the thigh-bones there is more muscle in the inside than o the outside of the upper part of the thighs. If the hips are narrow and the thigh-bones close together, the space for muscles is automatically limited. When you see it stated that a man has thighs measuring more than 24 inches around, you can be sure that his hips are more than average width. The great majority of men who do harness-lifting, back-lifting, and platform-lifting, or who carry great weights on the back, or on one shoulder, have great thighs and wide hips. Such men have uncommon power in their loins. If you are interested in outdoor games and athletics, you probably know that a man with natural advantages will excel at a particular event. It is well known that a long-armed man, if he gets the proper pitching motion, can deliver a much faster ball than can a short-armed pitcher. And a tall, rangy man with long legs finds it easy to step over the high-hurdles in fast time, while a short- legged man has almost to make a high jump over each hurdle. It has long been supposed, or believed, that there is some magic strength in extra long arms. I have read books in which the author would introduce a man character whose purpose was to furnish the strength element. The description would be like this: "So and So was a man short of stature but famed for his prodigious strength. His shoulders were as broad as a platform, his chest round as a barrel and his muscle-knotted arms were so long that when he stood erect his gnarled hands hung almost to his knees." I think that the author must have had a gorilla in mind when he thought up this "Strong Man" character; for I have never seen a man of that description. I know lots of "Strong Men" but the ones who are long-armed are also long-legged. Once in a while I have seen a man whose body and arms seemed out of all proportion to his legs and hips, and the impression I got was that something had happened to arrest the growth of the upper limbs. Big hands, particularly if they are long-fingered, are a distinct advantage in the performance of some feats of strength. 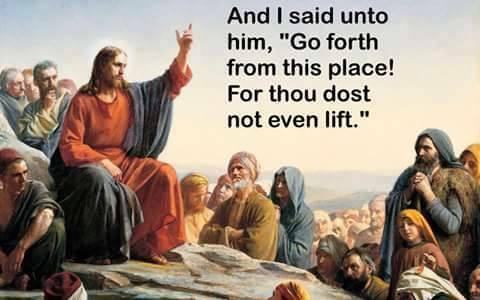 This applies particularly in the case of a dumb-bell-lifter. John Marx had enormous hands with fingers so long that they would lap around a 3-inch bar. So in his act he used moderately heavy dumb-bells, but equipped them with very thick handles. A small-handed man who could have easily picked up with one hand a thin-handled 200-pound dumb-bell, could not possibly pick, up Marx's bell of that weight, because his fingers would not circle the handle. So Marx got what was perhaps an undeserved reputation for strength. I know men with small hands who have a prodigious gripping power. There are small-handed gymnasts who can "chin" themselves several times in succession with any finger of either hand; which proves that their hands are strong. Given a proper-sized grip a small-handed man, who is strong in all other respects, will lift just as much weight off the ground with one hand, as will his big-handed rival. Exactly the same principle applies to long arms. In some forms of wrestling, short arms, however thick and strong they were, would be a distinct handicap, because, if your opponent was extremely bulky, your arms would not be long enough to lock around him. On the other hand, I can conceive of a condition where long arms would be a disadvantage, particularly if your opponent got a wrist-lock and used against you the extra leverage of your own long arms. As I said before, I do not know any "Strong Men" who have disproportionately long arms. Even when of normal length the strong man's arms look shorter than those of most men because of the thickness of the forearm, and the overlapping of the deltoids. 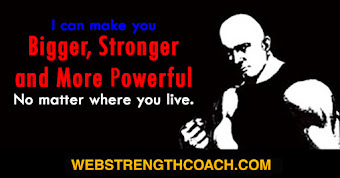 Strong wrists are indispensable to strength. In most ordinary feats of strength the object to be moved or lifted, swung or broken, is gripped by the hands; and those hands must be strongly coupled to the arms, so that there will be no break in the delivery of the power. A famous veteran, advising a new-comer in the professional ranks, said, "Young man, you will never be any stronger than your hands and wrists," and then proceeded to describe a few exercises to strengthen the wrists. And those exercises did not make the wrist any bigger but increased the strength of the hand-muscles, and particularly added to the size and power of the big bunches of muscle that lie in the upper half of the forearm near the elbow. 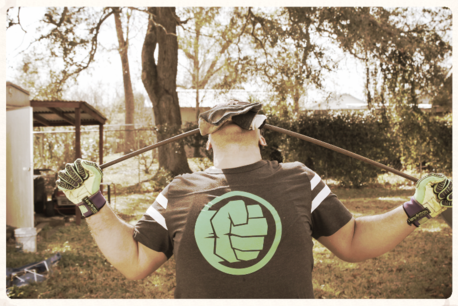 Wrist strength is something that can be cultivated.